The sun has still been shining which is crazy. In fact, I’m not sure I should even type it as I don’t want to jinx it. Let’s prepare for rain. Or snow. Who knows! Funny side story, my parents just got back from Barbados all brown and tanned (there’s no bitterness in my voice, is there…?) and then my mum sits in the garden for an afternoon in Britain and gets absolutely fried because she didn’t put suntan lotion on. Oh the irony. I thought this week I’d do What I ate Wednesday Sunday as it was pretty darn tasty, if I do say so myself. Thanks to Jenn as always for hosting this party. Let’s get started then! Breakfast was something a little bit crazy for me. I tried quinoa oatmeal. I’m not going to lie, this will never replace normal oatmeal. It was alright but nothing amazing. Quite a nutty taste. OK I probably could have put something more than just almond milk in it but I’m used to just plain oats so I was all at odds with what to do. I’m not good with change, people. Lunch however was a show-stopper. I was inspired by Sara’s recipe HERE which I just had to make at the nearest opportunity as it sounded so good. I made the strawberry sauce as per Sara’s instructions, using a little bit of Stevia and organic strawberries, microwaving them up to get them all jammy and amazing. This has been happening a lot around these parts as well. Thrown in the microwave in a hardy container, then sprayed with Fry Light and coated with salt. Cannot. Get. Enough. Dinner was two tortilla pizzas. Yes two, I am a pig. No judgement please. Can I just say that when lunch requires two dinner place mats you know it’s going to be good. I used wholemeal tortillas, covered them with a home-made tomato sauce using half a tin of chopped tomatoes and a load of Italian herbs. I then covered it with a whole load of veggies (onion, zucchini, mushrooms), chopped chicken and blobs of cream cheese. And BBQ sauce. Just because Then oven-cooked them for like 12mins. An honourable mention also needs to go to Monday night’s dinner. Strawberries, quinoa with a tablespoon of honey mixed in, and feta on salad. And Ben even enjoyed this. In fact, if I remember correctly he said “can we have this again?” Jackpot! Top from Warehouse (new! ), jeans from Top Shop, wedges from Dorothy Perkins (new!). Absolute school girl error though in wearing my new shoes to work and then walking to the shops at lunch in them. Stupid. Now I have two big old blisters. What’s the best thing you ate today? I think mine was popcorn as part of my lunch at work…see, I’m addicted. What’s your favourite pizza (or tortilla pizza) topping? Mine is BBQ chicken with loads of veg. Does your partner eat the same food as you? My hubby will normally eat what I eat but if it sounds ‘too healthy’ he will opt out and have something more “manly’”, like cheesy pasta. He avoids sweet potato like the plague, it’s heart-breaking. I have a confession. Actually I have a few confessions. Nothing major. I just feel the need to get it out there into the universe. Then let the universe judge me, or something or other. I am becoming an old lady (I hasten to add that there is nothing wrong with elderly ladies, I hope to be one someday – just not at 24!) Consistently now I have started to get tired at 8.30pm. And then 9pm I’m in bed. Actually in bed, pyjamas, brushed teeth, ready for sleep in bed. Now I have every intention of having a good read of my book to chill me out. However, I begin reading and 10 minutes later I’m asleep. And considering I don’t get in from work until 7pm, this is not very good. Ben is no longer surprised. Alfie no longer joins me as he knows lights off is quite soon. But you know what the worst part is? I love it. I get a full on 8 hours sleep. *Drops head in shame* I am an embarrassment to all those hip young twenty-year olds out there. Judge away. What can I say? I’m definitely a morning person. I start waking up from 5.30am onwards feeling nice and refreshed ready to hit the ground running (literally). Next confession. Over Christmas I didn’t really go crazy on eating vast amounts of chocolate or biscuits. I just didn’t fancy it. Now January’s hit and it’s like BOOM I just can’t get enough. And all the chocolate from Bruges I got is just calling to me. And I just can’t get enough of my favourite chocolate (which I put in the fridge for that extra bite). And I have since discovered the dark chocolate and mint flavour. This isn’t good people. Well, obviously it is! I’m fine throughout the day, it’s just when I’ve had dinner and I’m chilling on the sofa and I get that feeling. I’m sure you’ve all felt it (if you haven’t, tell me your secret! )…that “I NEED SOMETHING NOW! !” feeling. And it’s never savoury. So most evenings I’ve been scoffing it and our supplies are dwindling…but I will be buying more. Life isn’t worth living if you deny yourself these pleasures! I just need to work out how to control the beast within. My last confession is a dull one I’m afraid. I used to eat fish twice a week – proper oily, omega laced fish. Rainbow trout, salmon, mackerel….but now it’s somehow been forgotten. I’ve focused my energy on chicken. I’m not even sure how this even happened! So to remedy this sharply, I had sea bass. I dusted it with some ready-made seasoning (a fish-specific one) grilled it and had it alongside mashed cauliflower with goat’s cheese (heaven! ), roasted root veg and my favourite veg, broad beans. What a meal! The lightness of the fish worked as there was quite a lot on my plate (maybe another confession of mine is that I’m a greedy eater – it’s all about volume with me! Stack is high and I’m good to go). What are your secret confessions? What do you love having a naughty snack sesh on in an evening? Hi guys! Hope your week is going well. Mine is sailing along. Work is good, home is good, Ben is great and Alfie still needs a hair cut. Well, you can’t have everything. He’s a lucky pooch at the moment for escaping this particular event. But soon…just wait, he will be smartened up whether he likes it or not! Why I do believe it’s Wednesday! Soooo another WIAW post if you don’t mind. And I’m finally matching the Halloween theme for this month! I love getting involved in this because it really makes me conscious that I need to eat less boring food and make things exciting, for fear of boring the hell out of you. Well, you might still find it boring but I’ve put some effort into my eats this week…so prepare yourself. Breakfast: I thought I’d throw something new out there (new for me, not for the nine billion other bloggers who have done and dusted this a million times before). Pumpkin pancakes! These were undeniably delicious. Ben looked at me in disgust when I told him what I was having for breakfast. I ignored him; he just doesn’t understand the pumpkin craze. I used this recipe from Ashley’s blog. OK it’s meant to be a waffle but I don’t have a waffle maker…yet. [Mother, if you are reading this –> IDEAL CHRISTMAS PRESENT]. I also didn’t have any chocolate chips but didn’t really fancy any so it worked out nicely. I then jazzed them up with some raspberries and peanut butter sauce. I was stuffed. I wasn’t hungry for hours! And they were so simple to make. For lunch I wanted to use my little munchkin to make a quick soup. I roasted up the chopped munchkin (sounds a bit harsh doesn’t it?) and a couple of carrots while slowly sweating some diced onion in a pan with some garlic. Then I threw the roasted veg in with the onion. I added some vegetable stock and some spices (cumin, a touch of cinnamon and nutmeg, lots of pepper). I simmered until it all smelt yummy and the veg was completely soft. Then I whizzed it up with a hand-held blender. I sprinkled some pumpkin seeds on top but I hadn’t roasted them yet so they look a bit feeble to be honest. But the soup was very tasty. Warm and filling! Ideally I would have liked to have had a chunky slice of rye bread alongside but realised I didn’t have any (bad planning) so had to do with three rice cakes but added some Philadelphia to make them taste less like cardboard. Not nearly as exciting but not too shabby actually. Dipped in the soup it worked out quite well. So a bit excessive on the pumpkin front, but tasty none-the-less. Dinner: I decided to try a new recipe that I’d found here. Such an easy recipe with ingredients that I adore (hello goat’s cheese obsession). Basically it’s sliced cherry tomatoes, fresh thyme, chicken, goat’s cheese and a splash of olive oil. In the oven for 30mins (or until the chicken is cooked through). I served mine up with a corn on the cob that I got from the farm shop. And for Ben I made some garlic bread (as we’d run out of our usual stash from the freezer). Granted, it does just look like dry toast with bits on it. But I soaked the bread in some butter that I’d ‘infused’ with garlic and then oven baked. He said it tasted amazing and that’s all I care about! Snack-wise was usual. An apple, a banana, another apple, Snack a Jacks, maybe another apple (who’s counting anyway??). For my fitness I’ve changed my routine. Shocking news, I know. It’s just too damn difficult to get up half-way through the night at 5.30am. I’ve moved my runs to lunchtime. This actually came about because a woman at work who knows I run and wanted to start running at lunchtime and invited me along. I wasn’t too sure but thought I’d give it a try. I still do my strength training in the morning (three times a week) but I can start half an hour later because I’m not running the morning. Woohoo! And believe me, there is a BIG difference between getting up at 5.30am and getting up at 6am. Anyway I was ready to run but unfortunately she was suffering from a cold. So I thought I’d still go and ‘check the scene’ you know – the lay of the land and find a route and see how it went. It went amazingly! I got a personal best time for 3 miles – 22mins 30secs!! Despite the fact that the hills around where I work are a NIGHTMARE. OK, it doesn’t look so bad in the photo. But let me tell you, IT KILLED ME. Anyway, the next day I was aching like crazy – which I haven’t done after a run in ages. Not too bad I suppose! So the verdict is, I prefer now to run during work. It’s so nice to get out in the fresh air at lunch time. It makes me feel less bitter and grumpy at the world in the morning – I’m in a less dark and twisty place And gone are my slug dodging mornings. The change in routine is working out really well. I do three sets of strength training a week (more to come on that in another post), two runs a week at work, one at home (so I can push Ben out of bed and come with me) and then Pilates at the weekend. Whew. So good food, good runs, happy Anna! When do you work out? Morning? Evening? During work? What have you been eating and loving recently? So last post I mentioned that I had very busy Saturday with lots of wedding arrangements and having lunch out with my mum and sister. Sunday was equally busy as well. We had our ceremony rehearsal at the church in the morning after the Sunday service, and all the ‘main players’ (ushers, bridesmaids, etc.) met us there and we had a dry run-through. It was quite surreal and we joked all the way through it. Like my dad and me did a funny walk together up the aisle. People objecting to our marriage. Then when Ben was repeating his vows I kept winking at him or pulling faces so he kept laughing. It was very funny and the vicar joined in as well. It made things a lot less scary! Then from there we went straight to our reception venue to go through the final details and timings. So I feel a lot more ready now. I know what’s going on and that everything is pretty much sorted. So then we went to more cheap shops to get better value for our money. And then it was a case of deciding which jars which sweets would go into. This was fairly difficult as I didn’t want to open any sweets yet so they would keep fresh for as long as possible…so it might need tweaking on Friday when I’m sorting out last minute details. The doilies are great! I love the vintage look. And the paper plates will be for cupcakes that my friend is baking me for the day. 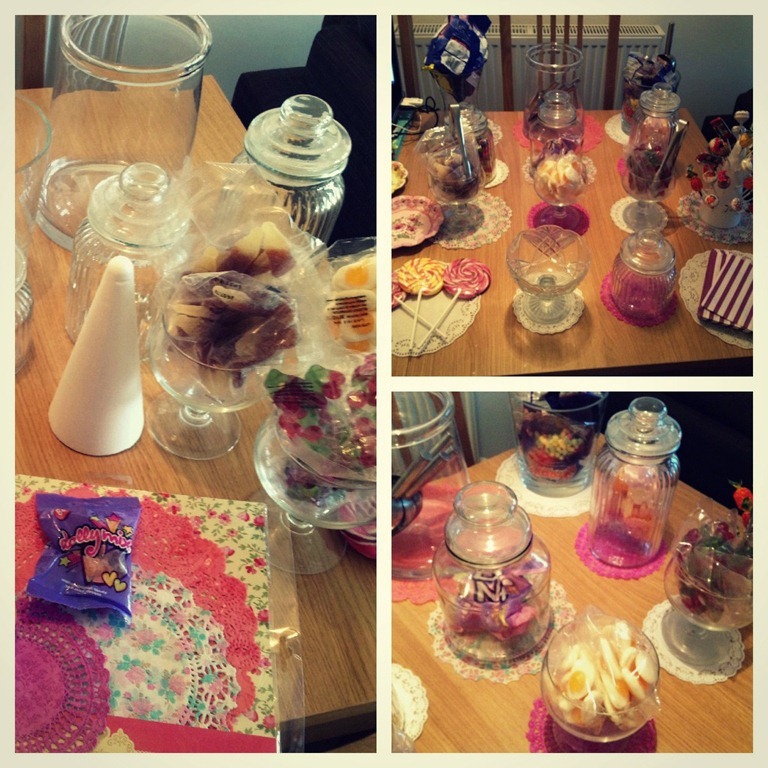 So it’s going to be a plethora of sweet goodies…I’m so pleased with how it’s turning out! I’m absolutely the least creative person, so this is pretty good for me. I got all the jars from charity shops so the costs have been kept down. And I’m chuffed with the table favours too. I bought the paper bags from Amazon for like next to nothing and got some ribbon from Hobbycraft. Each table has a sweet name (like Jelly Babies or Liquorice Allsorts) and then each person on that table gets a bag full of that sweet. Top table gets a mixture of everything (win!). I mix about 1/2 cup of oats with 1tsp of wheatgrass and a sprinkle of ground flaxseed (a new addition!) and then unsweetened almond milk. Nuke in the microwave for 3.30 mins (stirring half-way) and it’s good to go! Fills me up really well until lunch time (which is like a good 4.5 hours later!). Chickpeas, lots of herbs (mixed and coriander), lots of minced garlic, lemon juice and a big dollop of tahini paste. Then whizzed up in a food processor. Lovely. Really sweet and flavoursome, which complimented the hummus perfectly! Then I threw on lots of toppings (more goat’s cheese, chicken, mushrooms & courgette) and baked for about 8 mins. Doesn’t look like pizza, granted (except that it’s round) but it tasted gooood and I was stuffed. Two chopped apples (always chopped, never whole). With the wedding coming up I’ve not been that adventurous with my cooking (there are quite a lot of repeat offenders) but during my honeymoon I hope to have some very exciting eats!! Workouts have been fairly standard. I did manage a quick interval run on Sunday (2 miles) despite not thinking I’d get anything in. And then yesterday I ran another 2 miles and did some core workout. I can now hold a plank for 3 mins, woohoo! Abs of steel! *Cough* Well, moderately firm. Important meeting in London today, so the smart dress is out in full force! Happy WIAW all! Happy eating [and viewing]!